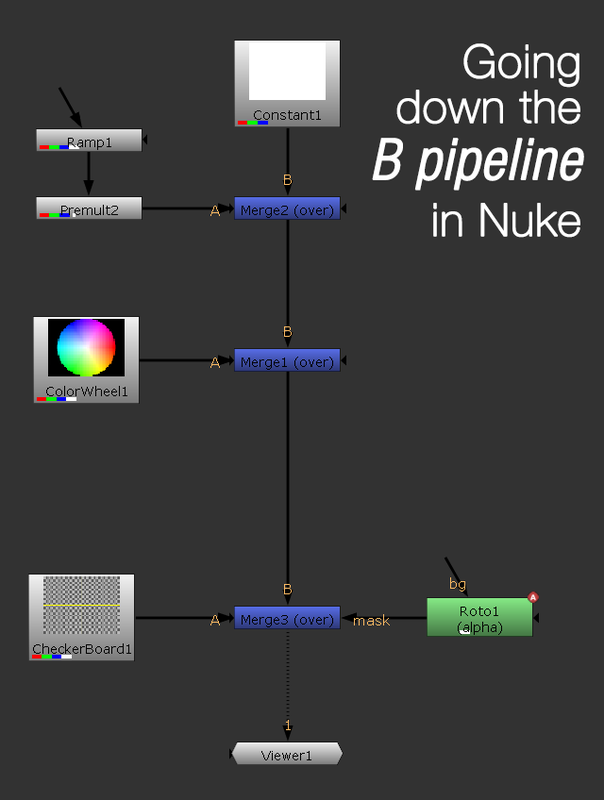 In Nuke, whenever you have any nodes that have A and B input, usually the operation will involve processing A over B. Therefore by disabling the node function, we allow input B to pass down through the pipeline operation as input A will be blocked from being processed by Nuke. By configuring B to keep going down the pipeline, we can easily identify the purpose of the node by simply disabling it and see the result in viewer. Below is a simple script example to demonstrate the B pipeline process. Just disable any of the merge node to observe how the B input will pass on to the next merge node operation in the viewer. label "By keeping A\nto the left of\nthe B pipe,\nyou can attach\nany alpha to\nthe mask input\nthat is found in\nthe right side of\na node." label "This is to ensure\na clean script\nlayout without\nhaving spider\nweb layout." label "Disabling any nodes that\nhave A over B will result\nin B piping in \nthe downstream."